This is in immaculate as new condition and has been used for just 3 hours due to lack of time. 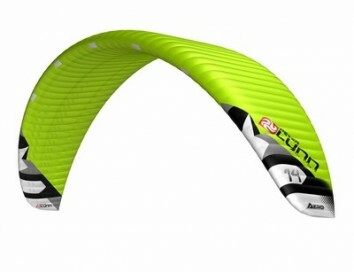 The Aero is completely built with 20D Fabric to ensure the light wind performance associated with this type of kite. To create the kite's high dimensional stability we used 30D hard coated fabric for the internal construction. To increase the aerodynamics of the kite, a fibre batten has been fitted on the front of each panel to create a very slick ‘nose’. While these fibre rods keep the nose tightly in shape they also add to the overall stability of the kite and help prevent luffing. The Aero’s high Aspect Ratio and high cell count make for a very thin and slick wing. The high number of cells ensure the wings dimensional stability and prevents deforming of the designed shape. The High Aspect ratio makes the kite cut upwind like a knife and allows for high flying speeds. The bridle tabs are double stitched and reinforced with a Dacron patch for strength and durability, a Peter Lynn system which has proven its reliability time over time.